Some version of Hercules’ world has appeared in most Kingdom Hearts games, starting with the very first (actually all of them other than Kingdom Hearts 3D: Dream Drop Distance). And yet despite its almost constant presence, there has been relatively few advancements along the way, with the Olympus Colosseum being the main setting in most games other than Kingdom Hearts 2, which expanded this world to include Hades’ Underworld as well. 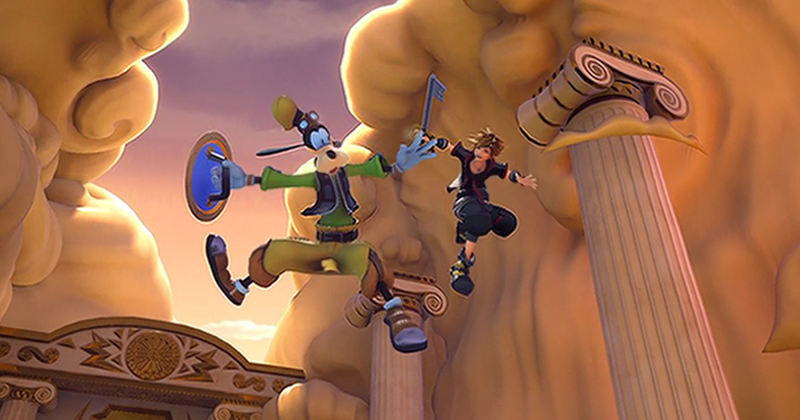 The first Kingdom Hearts III trailer showed off a lot of the new version of Hercules’ world, which looks to be more of a Mount Olympus styled area (we can guess at that from the clouds at the top of pretty much everything), and entirely new to the Kingdom Hearts franchise. The Hercules and Hades storylines have always been some of the more original in Kingdom Hearts, moving away from the often used ‘simply playing through the story of the Disney movie’ and having some more unique encounters with the Hercules characters, which looks to be the case again here. Corona was the first new Disney world to be announced for Kingdom Hearts III, and is the first of the 3D Disney movies to make it’s way into the franchise. All of the graphics for Kingdom Hearts III look great so far, but some of the shots of Corona, Rapunzel, and Flynn look like they’re ripped straight from the movie itself. 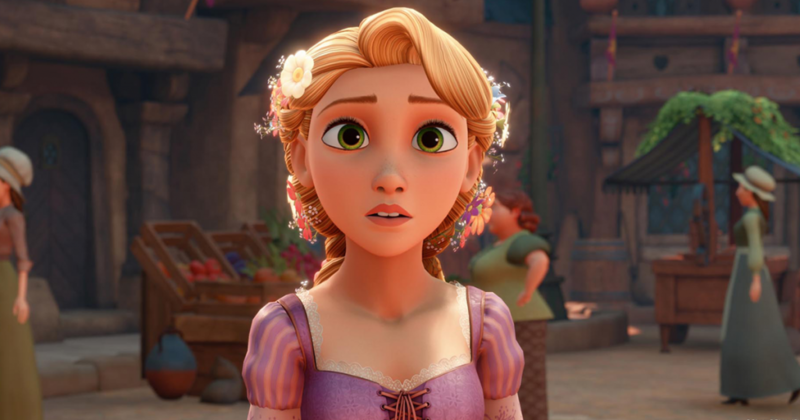 From the brief parts we’ve seen of this new Tangled world, it looks as though it will follow a more traditional route and replay a number of events from the movie itself, but how that works into the overall story of Kingdom Hearts is yet to be seen. Finally (fully) revealed in the latest Kingdom Hearts trailer, we see Sora, Goofy and Donald meet Baymax and Hiro (along with some other characters from the movie). 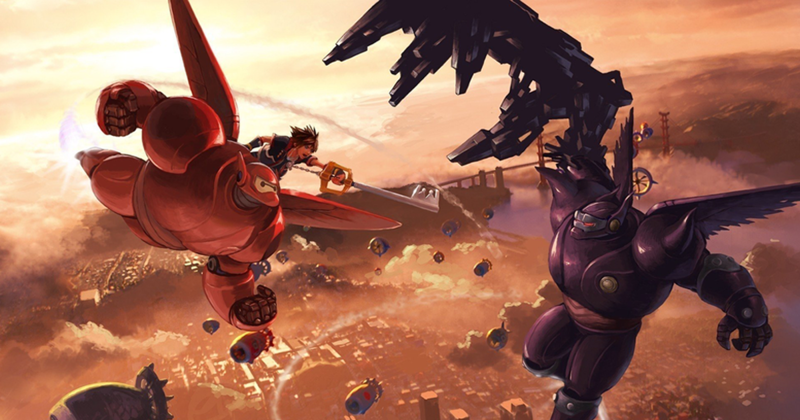 The Big Hero 6 levels look to show if the San Fransokyo bridge, as well as other parts of the city. In the movie San Fransokyo is an alternate city that combines San Fransisco and Tokyo, and was built after an earthquake in the early nineteen hundreds (instead of modern day San Fransisco). 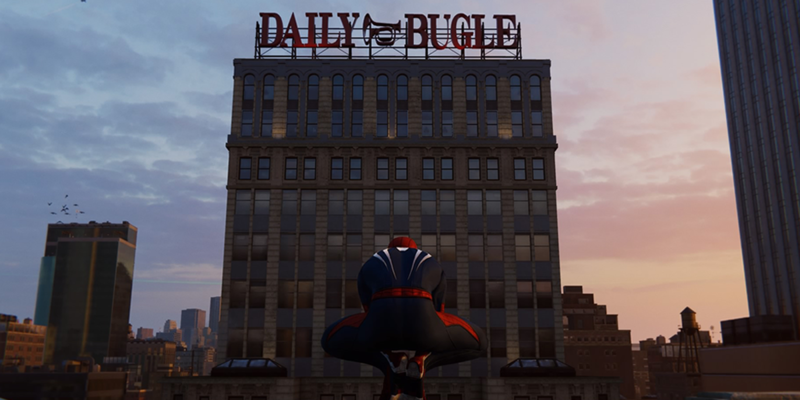 The potential of the city (which again looked great in the movie, and will surely translate into a video game very well) is huge with a futuristic and tech orientated world that would fit Kingdom Hearts perfectly. One thing we definitely do know is that this adventure will be taking place after the movies’ storyline, and will be all new Baymax story. 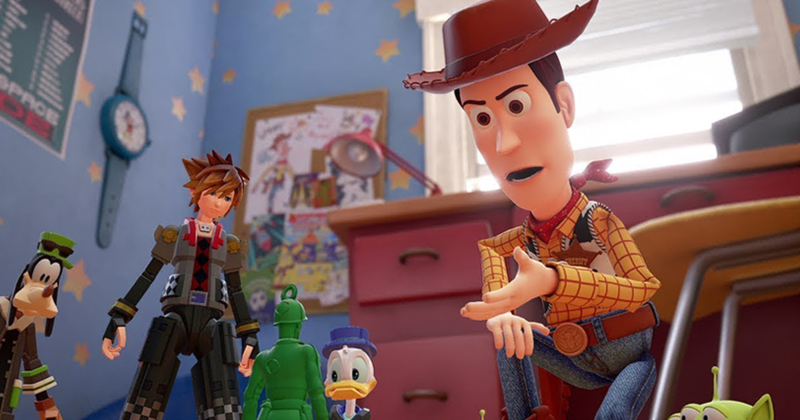 There is no better way to finally bring the much demanded Pixar franchises into Kingdom Hearts than with the first feature film the company released, Toy Story. 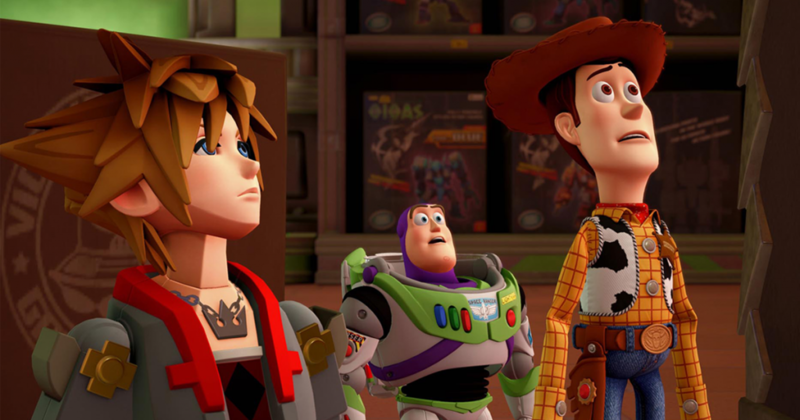 A Toy Story word has been one of the most requested additions to Kingdom Hearts for years, and as you’d expect looks like it will be one of the most interesting worlds in Kingdom Hearts III. In what looks to be another original story Sora, Goofy, and Donald find themselves turned into toys and in Andy’s room, they then work together with Woody, Buzz, Rex, Hamm and the Army Men, to take on the invading Heartless who appeared around the same time their ‘friends’ disappeared from Andy’s bedroom. How this then leads them to a toy store (that isn’t an Al’s Toy Barn from Toy Story 2), is unclear but the powers, and characters look like a great addition to the franchise. 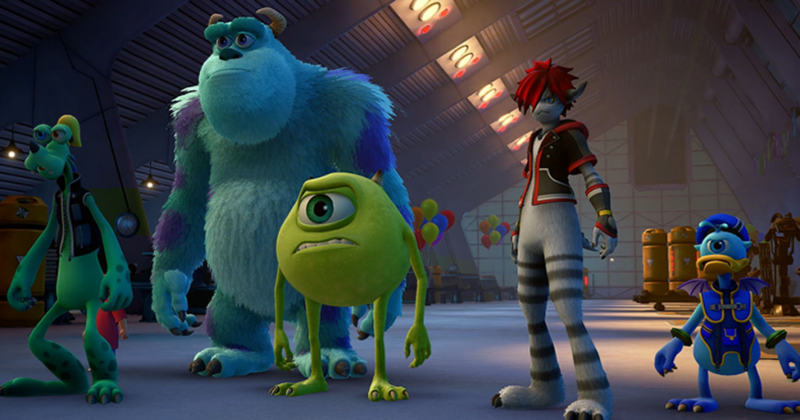 The second Pixar franchise to make it’s way into Kingdom Hearts is Monsters Inc, with Sora, Goofy, and Donald becoming Monster versions of themselves. This world is another that looks to mirror the plot of the original movie with some Kingdom Hearts characters thrown in here and there. If there was any Disney movie from the past few years that you could bet actual money on being included in the next Kingdom Hearts game it was Frozen. The 2013 smash hit managed to become one of the most successful Disney movies ever (setting a huge number of records) with a number of it’s songs breaking into the regular music charts, and totalling to a pop culture sensation. From the brief glimpse of Arendelle it looks to be another ‘acting out the movie’ world, which are often fun, but not as good as the more original ones. 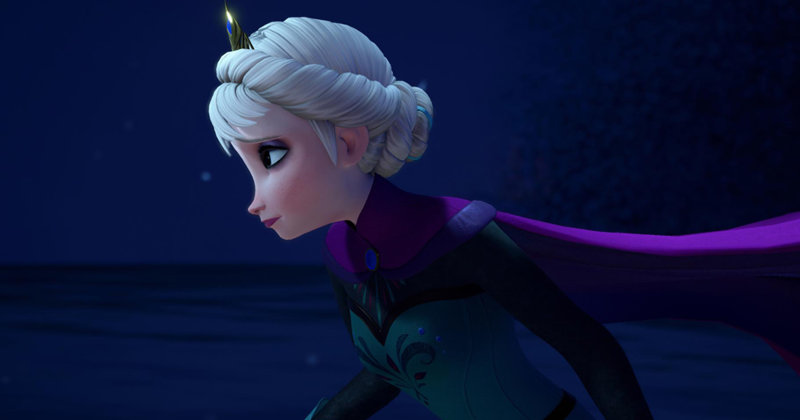 How (if at all) the very (very) popular songs from Frozen will play in is unclear, but Elsa, Anna, Kristoff, Sven, and Olaf’s addition into Kingdom Hearts looks to be another of the games big set pieces. The Port Royal world in Kingdom Hearts 2 was an interesting surprise, with the game coming out only two years after the first Pirates movie. It saw characters such as Captain Jack Sparrow, Barbosa, Will Turner, Elizabeth Swann, and a number of unnamed pirates. The world was split into four areas, Port Royal itself, The Interceptor and the Black Pearl, Isla de Muerta, and the Ship Graveyard, and combined some new events with the storyline of the first Pirates movie. 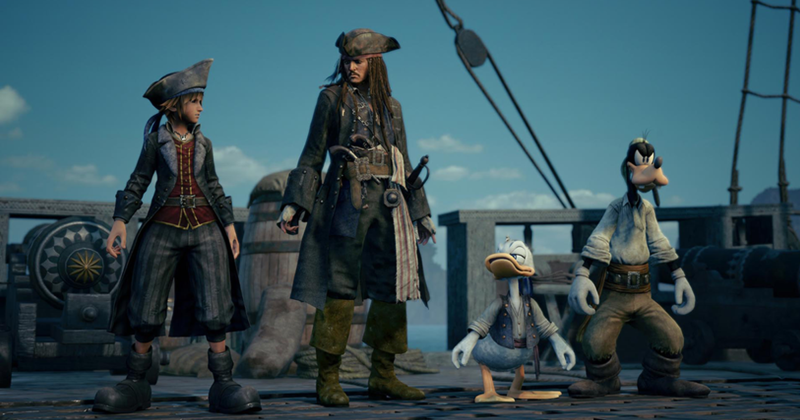 The only real part of the Pirates World we can see this time (where Goofy points out Sora always enjoyed being a Pirate) is Davy Jones Locker, in some scenes that are taken straight from the third pirates movie (and yet again have some incredible graphics and character models). We do however see that this world involves some interesting ship based combat and Sora taking on some sort of giant sea creature. Along with all of these worlds Kingdom Hearts III features the return of Gummi Ships, another great Kingdom Hearts soundtrack, and some awesome looking summons that include an Ariel from The Little Mermaid sort of whirlpool, Remy from Ratatoulie, and Ralph from Wreck it Ralph.